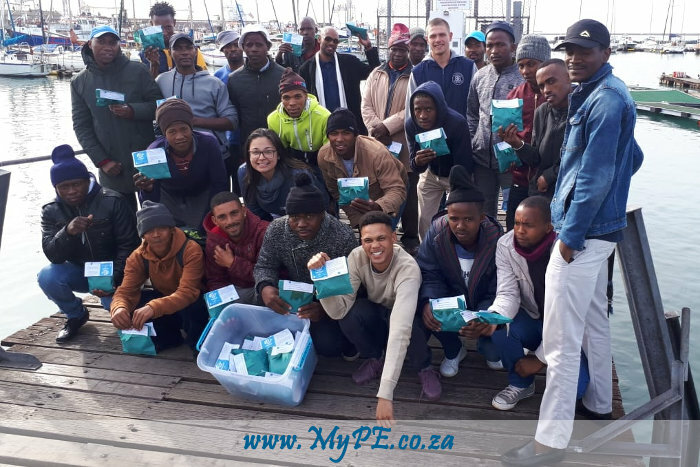 Local chokka fishers, who are going out to sea for the first time, with the Siyaloba Training Academy care packages received to celebrate “Day of the Seafarer”. Siyaloba Training Academy observed the annual, international “Day of the Seafarer” today by acknowledging and celebrating local Chokka fishers, who are integral to the R650-million Squid Industry in the Eastern Cape region. Siyaloba and employer representatives were on hand to distribute care packages to fishers who set sail on the annual opening of the season on Friday 22 June 2018. The South African squid fishery is based on a single species, Loligo reynaudii, commonly referred to as “chokka”, also known as “squid”, “calamari” or “white gold”. Fishing boats are equipped to sustain its fleets for up to three weeks at sea while the crew fish for shoals of chokka off the coast of Port Elizabeth, Jeffreys Bay and St. Francis Bay. South African Squid Management Industrial Association (SASMIA) Chairperson Dino Moodaley said, “The squid industry exports 100% of its product. Most of this is to Mediterranean countries such as Italy and Spain. The industry brings over R650-million in foreign exchange to South Africa every year. This would not be possible without the squid/?chokka fishermen and we salute these dedicated men on Seafarer Day 2018”. The crew live, eat and sleep on the vessel during their up to twenty-one-day trips. The fishers start casting their lines when the sun begins to set, and they stop as the sun rises the next morning. The catch for the evening is weighed and then they head off to their bunks to rest. Siyaloba Training Academy was started to provide basic life-saving and safety at sea training to the squid fishermen, but now also supports the fishers’ families and coastal communities where they reside. Since the organisation’s inception in the Squid Industry the offering had been augmented to include life skills, business training, numeracy and literacy interventions, entrepreneurial development and learnerships. The International Maritime Organization (IMO)’s Day of the Seafarer (celebrated today on 25 June 2018) sets out to recognise the unique contribution made by seafarers from all over the world to international trade, the world economy and civil society as a whole. The 2018 Day of The Seafarer Theme is “Seafarer Wellbeing”. By addressing the issue of seafarers’ wellbeing and particularly mental health, the campaign aims to inform specific strategies to tackle stress and other issues affecting seafarers’ mental conditions – and make the tools available more widely known. In line with the Day of the Seafarer focus on “Seafarer wellbeing”, Siyaloba Training Academy offers various personal development and life-skills training courses to address the overall well-being and holistic development of the fishers. These interventions include topics such as Adult literacy training, Personal finance, HIV/AIDS awareness as well as Conflict management, to allow the fishers to engage and achieve their full potential. Small Employer Association Squid Industry (SEASI) Chairperson, William Gqeke concludes: “There are 2 440 fishermen on chokka vessels in the region. This is remarkable in terms of employment – as the third largest fishing employer after deep-sea hake ad small pelagic fishing. The squid employers wish the fishers well on the Day of the Seafarer and thank them for their service”.